12/19/2003 01:25:23 PM Mountain Al:: mm: did you get any of my 3 emails this morning? 12/19/2003 10:19:35 AM Mountain mm:: I meant quadruple witch ! 12/19/2003 10:01:28 AM Mountain jcsg:: that low looked like wave c of an expanded flat for elliott fans. If so, it will go to new highs. 12/19/2003 09:28:47 AM Mountain mm:: Since it has never happened before it just may be a fluke and I'm not going to spend my time asking/complaining to eSignal. If it happens again I'm going to rattle their cage. 12/19/2003 09:15:18 AM Mountain dc:: has the spike issue been resolved on eSignal yet? 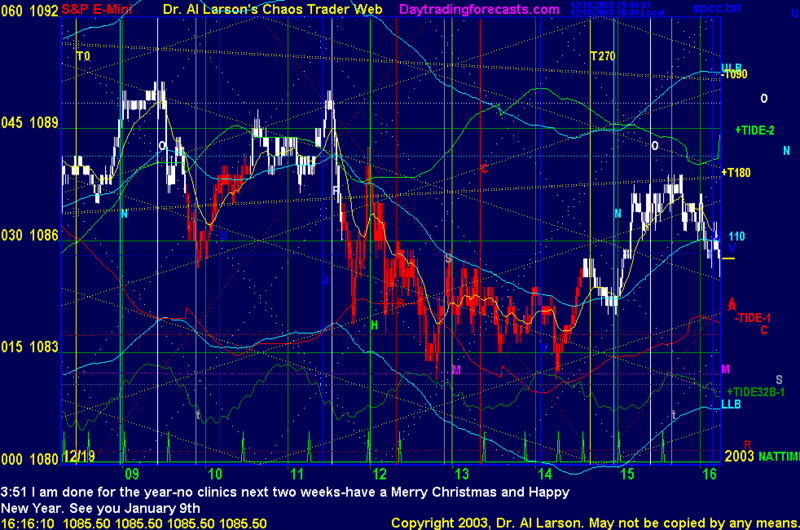 12/19/2003 08:36:28 AM Mountain wlj:: mm, i did a refresh and spikes still there, chaos chart has no spikes ? 12/19/2003 08:32:32 AM Mountain mm:: I don't have access to charts of the BIG SP, so I want to ask: did it also have the big jumps at 10:17 and 10:18? - I prefer the mini because one cannot get jerked around when the pit makes these breakout to pick up stops. I'm puzzed how this 3.25 point jump can happen in electronic trading. 12/19/2003 07:56:47 AM Mountain jcsg:: Like Al said in last night's e-mail, 1080 is the key level. If we break that rally may be over. 12/19/2003 07:39:28 AM Mountain bkw:: morning fellow inmates.